I agree, it’s a strange title for a final blog post. And I’m so glad that this is not a teary goodbye. It’s more of one door closing and another opening. For those of you who have been with me since the start of byjacquiesmith in 2015 will have seen my journey take twists + turns as it’s evolved. I started with providing digital craft supplies + transitioned into printable planners. Both of these I’ve enjoyed creating for you. And I’ve learnt a lot along the way, especially about myself. But I want to do more! And I want to do it better. In my journey of twists + turns, I’ve been squeezing in all these different things that I’ve collected along the way, like a set of over stuffed drawers. Now there’s socks + bits of t-shirts hanging out. Shorts getting stuck when I’m closing the drawers. You get the picture. So it’s time to Spring clean! And I do love a good clean out 🙂 I’d be happy to have Spring twice a year just to declutter. This clean out is not just taking out the old worn things that no longer have purpose, or folding to make things fit better. As I’ve been writing the Planner Playbook I realised that it’s more than just an ebook. It’s a way of planning + organising our life so that we can truly flourish in life. I want it to become the cornerstone of what I teach. So I’m not just cleaning out my drawers this year, I’m starting fresh! I’ll be doing better from a brand new home. A home that isn’t centred around my name, but one that represents you + the kind of life you’d like to live. I want it to be a place where I can really focus on helping you. I want this way of planning + organising our day to become the cornerstone of what I teach + how I help people have more time for the things that bring them joy! And while that’s exciting, I’m also sad to say this is the last blog post you’ll read from me at byjacquiesmith. My new home, and yours if you’d like to join me, will be at WhiteSpace Design Studio. My new “drawers” are being built as you read this. The new website is underway. I’ve learnt much in my work about design over the past 20+ years. And I’ve seen how many of the attributes of good design also apply to our lives. I recently wrote to my community about the need for white space in design + how important it is. White space gives meaning to the message. It improves legibility, helps us to understand better, increases our attention + communicates the right tone of the message. It’s also just as important in our daily lives. It helps us live a better life. One with greater meaning. Having white space on the page in a way that strengthens the message, comes from deliberate planning. Just as having space in our life to enjoy what doing, comes from purposeful planning. So I’m taking action on creating more WhiteSpace in my own life. My aim is for this new home to be a place where you can come for resources + support to plan + organise your day in a way that helps you flourish in business + life. 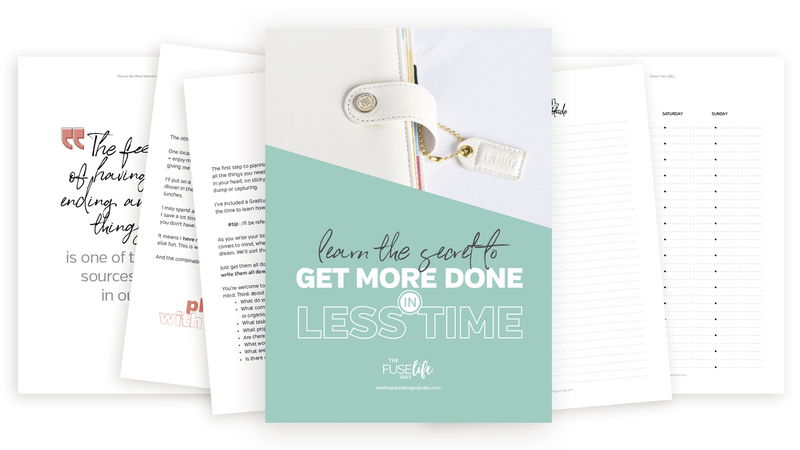 Most busy working mums are overwhelmed with trying to balance their business + family life, so I created a framework that helps them plan + organise their day with less overwhelm, to do the things that matter most and have more time for what brings them joy! I want to say thank you for journeying with me, for your patience, encouragement + support. Receiving your messages have been the highlight of my journey at byjacquiesmith. And I’m honoured to have helped so many people create a planner that not only helps them get things done but one that they enjoy using. The byjacquiesmith shop will remain open until mid 2018 when the new store on WhiteSpace Design Studio will open with new planner products for 2019. You’ll have plenty of time to download your purchases before the store closes here. To celebrate moving into my new home I’d love to share this new guide with printables with you so you can learn how to use my simple three steps process to do more in less time! Click the image to learn more and download the free guide + printables!